This uncommon name is of early medieval English origin, and is one of the patronymic forms of the surname created from Hulle, a pet form of the male given name Hugh. The given name was introduced into Britain by the Normans after the Conquest of 1066, in the Old French form "Hu(gh)e"; it is ultimately of Old German origin, as a short form of any of the various Germanic compound personal names with the first element "hug", heart, mind, spirit, such as Hubert, "heart-bright". The short, pet, form Hulle is recorded in 1201 as Hulle le Bulle, in the Staffordshire Pipe Rolls, and Hulle de Alperam in Cheshire in 1259. 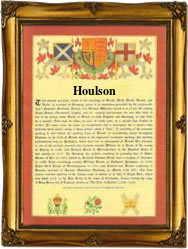 The patronymic forms of the surname, Hulson, Houlson, Hulls and Hulles, appear early in the 14th Century. In Scotland, one John Houlsoun witnessed an "instrument of date" in Prestwick in 1466, and Huchon Hulson was a witness in Ayr in 1471. Among the recordings of the name in London Church Registers are the marriage of Robert Houlson and Elisabeth Maydestone at St. Dunstan's in the East, on June 17th 1686, and the christening of Jeremiah, son of Roger and Alice Houlson, on September 9th 1697, at St. Giles' Cripplegate. The first recorded spelling of the family name is shown to be that of Thomas Hullson, which was dated 1308, in the "Register of the Freemen of the City of York", during the reign of King Edward 11, known as "Edward of Caernafon", 1307 - 1327. Surnames became necessary when governments introduced personal taxation. In England this was known as Poll Tax. Throughout the centuries, surnames in every country have continued to "develop" often leading to astonishing variants of the original spelling.